A review and story about the environmental illness documentary The Sensitives, directed by Drew Xanthopoulos. The Sensitives follows three families stricken with severe environmental illness. We are first introduced to Joe and his wife Lanie, who live in a comfortable house in a leafy middle class suburb of Kansas City. Joe has been sick for about a year and is still struggling with figuring out some of the ways to manage the situation. They have converted an upstairs bedroom to be his non-toxic haven by removing everything that is not essential, tearing up the carpet, covering the walls with aluminum foil and installing two large air cleaners, as well as simple furniture without upholstery. In the first scene, Lanie is cutting Joe�s hair since he can no longer go to any hair salon. Hair salons are some of the most toxic places most people ever enter. A fitting start to this film. Joe is still trying to figure out everything that is a problem for him, a task that can take years of trial and error. He wears a respirator much of the time when he is in the rest of the house, but he tries not to wear it when the grandchildren visit as he doesn�t want them to see him that way. The couple have been married for thirty years, so they have a lot of ballast in the relationship, but it is hard. It has become all about his needs while hers are neglected. This creates tension. Joe is clearly a family man, as we can see in old family videos where he plays ball with his family. But now he is often relegated to his safe bedroom, while the grandkids play ball in the yard outside. Joe drives with Lanie and their daughter to a new housing development in Texas that has ten colorful cottages specially built for people with environmental sensitivities (see www.eiwellspring.org/multiunit/TenTexasCottages.htm). The hope is that Joe will get better from living there. Joe talks to one of the renters. She complains that he smells of fragrances. That completely surprises him. He reacts with anger and disbelief. This is actually a common situation, as newbies tend to think of themselves as the most sensitive person in the world until they meet someone who is more sensitive. In this particular situation he admits to having gone inside a Whole Foods store, which will make his clothes fragrant. He probably also visited a public restroom on their long drive from Kansas — even a very brief visit to a fragrant bathroom would make his clothes fragrant. With all the exposures on such a long drive it is not surprising that Joe is unable to tell that he is no longer scent free. Joe also realizes how difficult it is for other people to understand his level of sensitivity, just as he just doubted someone else who had the same illness. They return home and Joe hires a specialist to modify the electrical wiring in their house. These and other measures apparently help, as Joe seems to be doing better at the end of the film. The Akers family�s situation is very different. Karen Akers and her two adult sons, Sam and Nathan, are much sicker than Joe and have been so for several decades. They are poor and have few resources available, except for Karen�s elderly mother, Fay Akers, who does all their shopping and is the only person visiting. When she brings the groceries she can�t enter the house since her clothes are contaminated by the stores she has just been in. Sam and Nathan have been sick all their lives and are not getting any better. They are so fatigued that they spend much of each day lying down. Their pleasures are limited to talking to their grandmother through the window, reading books and letters and playing on the guitar. They also compose their own music. They keep a positive attitude despite a very challenging situation that nobody expects will improve. The family has figured out all the little details on how to make life workable with simple measures, such as asking friends to enclose letters in aluminum foil (to protect while passing through the mail system), hanging papers to be aired out, encapsulating the books (to protect against ink fumes, etc.) and making their van less toxic, by covering the seats and removing the interior panels. Fay Akers was able to pay for the land and the small house that was built for her daughter and grandchildren. It is located in a rural part of the Arizona desert where the air is very clean, and is built of concrete blocks and ceramic tile. It works for them, but development is encroaching and their neighbor burns trash and sprays pesticides. They may eventually have to move again. When the elderly Fay dies, Karen, Sam and Nathan are left to fend for themselves. We see Karen do their shopping, but we don�t see what impact it has on her. At the end, the Akers go on a trip in their van, but there is no explanation where they go or why. The third family consists of one person and her dog. Susan Molloy has been sick for about 35 years. Originally from San Francisco, she moved to Arizona 25 years ago and lives in a small house that is specially built for her in an MCS/EHS neighborhood near the town of Snowflake. The film shows a part of the 1990 television program Bad Chemistry where Susan is shown barely able to talk, or even use her hands, when exposed to the air in a regular office. The clean air of the Arizona desert did wonders for Susan, who arrived in a wheelchair and could walk again after being there a few months. Now she delivers groceries to her neighbor and listens with sympathy to the many sick and desperate people who call her on the phone. The effort these many phone calls take is evident in a scene where she checks her voice mail and to her relief there are none. Susan does a lot of advocacy work to try to get help and acceptance of people with the illness, but it is very slow going. She is the hero of the film, together with the caretakers Fay and Lanie. Susan travels to Washington, D.C. to attend a big National Council for Independent Living disability conference. 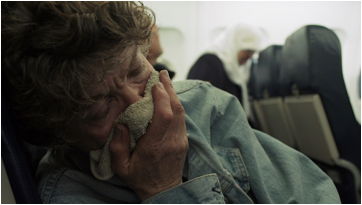 Once out of her safe home in the safe rural desert, the fumes in the airport, on the plane and from the traffic in the big city take a severe toll. It is shocking to see the effects on this person who seemed so functional. Susan Molloy braving the airplane. Picture courtesy of Drew Xanthopoulos. She is determined to be heard by this big national disability organization and speaks up where she can. The officials are very polite, but no help is offered — not even the little footnotes she asks for. Her trip is the closest the viewer gets to experience what it can be like to be severely hypersensitive in the outside world. The impact cannot be conveyed by a movie, or any other media, but the filming here is at its best, with a myriad of subtle details and a few not so subtle. Much of it is reflected in Susan�s expressive face. The difficulty in making a film about such a deeply life-changing and invisible illness is to make it relatable to the audience — especially when the illness is contested and not well known. It could easily turn into a freak show with the audience believing it is just a bunch of mentally sick people. The Sensitives accomplishes its difficult task very well. It starts by presenting the situation of the most �normal� person, Joe, who obviously lived a financially successful life before he got sick. He is accepted and supported by his wife and two adult children, who treat him with love and respect. Many people can relate to the caregiver role, which is often a thankless one-sided task. It is very similar to so many others taking care of a sick or disabled spouse, parent or child. It is then less of a shock to see the much worse situation of the Akers family. Then the endearing Susan, with her indomitable spirit and story of getting better from moving to a place with clean air, adds a lot of hope to the whole story. The grandmother and wife who are caregivers, the energy of the grandchildren who visit, and the expressive dog who watches over Susan Molloy all tell us that we are still dealing with humanity. The sensitive people may be forced to live in isolation from most of society, but they crave company just like everybody else. They are not so different after all. The director, Drew Xanthopoulos, was able to gain the trust of the people he filmed so he could get close enough to create accurate three-dimensional portraits. That was no easy task, as many people with these illnesses are well aware of the disrespectful stories that have been published over the years. Xanthopoulos could have made his job easier by choosing to film people who are a lot less sensitive and who live lives that appear normal to outsiders. Instead, he chose those whom much of society would prefer to ignore, just as many of us avert our eyes when encountering a homeless person on the street. The three families are well chosen. They are as varied and human as the rest of the world and just happen to be stricken with a difficult illness. The film provides an accurate portrait of their stories with all their human imperfections, without adding any Hollywood style gloss or tabloid sensation. There are no villains in the film. The focus is on the people, not on what causes the illness or the controversies. Getting into the hot disputes between the various entrenched camps of the medical world, and the corporate meddling, would have taken up a lot of time and not been a good addition. This is not a political film, unless compassion is a political statement. It takes a hardened soul not to become sympathetic towards the people on the screen. Sympathy is essential for acceptance and this film may develop more acceptance of environmental illnesses than any educational or political film ever could. The film doesn�t tell the viewer what to think (unlike most media) and there is enough ambiguity that different people can reach different conclusions. The film premiered at the Tribeca Film Festival in New York in April 2017, where it was shown four times in sold-out theaters. The only person prominently featured in the movie who attended the premiere was Lanie. None of the sick people attempted the cross-country journey, which was a wise decision as the audience turned out to be highly perfumed, with lots of strong cologne. A respirator might not have provided sufficient protection. Few in the audience were familiar with the topic ahead of time. The film seemed to move many people — some were observed to be in tears. After the showing there was a question and answer period, where Xanthopoulos and Lanie answered questions. The only criticism of the film came from an MCS activist who believed that the most sensitive people should not be shown in public. The idea is that the most sensitive live lives so different from the mainstream that it is difficult for the general public to accept them, whereas the less sensitive are more �acceptable� as they live lives that appear more normal. Maybe that standpoint is really that those �more acceptable� do not want to be tainted by association with those less so. Perhaps that is the same reason why those big disability organizations politely refused to help Susan Molloy when she travelled to Washington, D.C. It is a common trait to feel disdain for those who are less fortunate. There are many such caste systems in the world. The Sensitives has since been shown at other film festivals, including the Camden International Film Festival, where it won an award. The film�s director, Drew Xanthopoulos, saw a photo essay about environmental illness in the September 18, 2011 issue of The New York Times. The article showed four pictures from the book The Canaries by photographer Thilde Jensen. He had never heard about this illness and it intrigued him. Using Jensen�s connections, Xanthopoulos travelled around to learn more and look for people he might film. Along the way he learned to become less toxic himself so he could visit people inside their houses instead of having to meet them outdoors. He kept a special set of clothes that had been hand washed in baking soda, and never saw the inside of a washing machine or a clothes dryer to prevent contamination from toxic laundry products. He switched to non-toxic personal care products, and stayed in a tent instead of a motel room. He kept his mobile phone completely turned off while visiting. He still had to do some filming through the windows of the Akers� house, since they were the most severely sensitive. This kept both Xanthopoulos and his equipment outside their airspace. The movie was often shot with the camera a little further away, using a longer lens, as the electronics in the camera do radiate some (which Susan Molloy demonstrates in one scene). A microphone mounted on a boom was occasionally used, but always with a wired connection to the film camera. Wireless microphones could not be used at all. This made the soundtrack more challenging and in places the sound is so poor the film has subtitles to aid the viewer. The film was shot over three years, which generated nearly three hundred hours of raw footage. It then took about a year to edit it into the final product. When the movie was nearly finished, Xanthopoulos showed it to the three families for their approval. He made it clear that if they hated it he would change it or kill it. They all approved it. Documentary films rarely make any money — they commonly bring in just half of what they cost to make. This film was crowdfunded with lots of small donations through the internet website Kickstarter. Some film foundations also made major donations. A fun little detail is that the production company is named �Normies.� Normies is slang for people who are not environmentally sensitive. The film was entirely created by normies, but with an understanding of the subject that takes years and an open mind to acquire. There are many subtle details that would take two or three viewings to discover. The film is available on DVD in North America, where it is sold with �Region 0� protection and is viewable anywhere in the world. Some American streaming sites, such as iTunes and Amazon Prime, also carry it. The film is available with subtitles. This is unfortunately rare for documentaries, and is much appreciated. Distribution in the rest of the world is still developing as of this writing. The film�s official website is www.sensitivesdoc.com. For reviews of other MCS/EHS films, see www.eiwellspring.org/filmreviews.html.